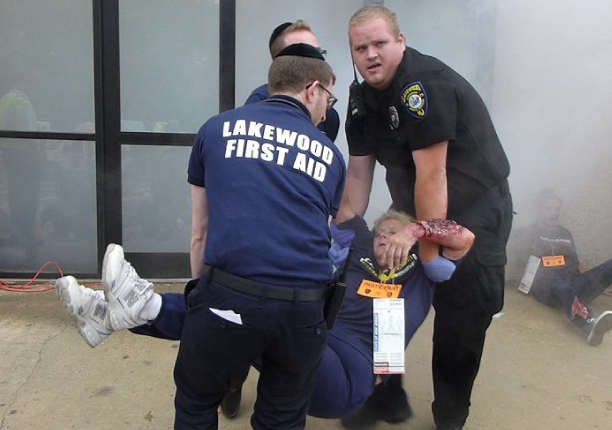 Lakewood First Aid helped coordinate and took part in a Mass Casualty Incident training drill this week in Lakewood, simulating a school bomb leaving close to 2 dozen injured and some fatalities. The rescue crews were not only tasked with treating 20 patients presenting with a variety of injuries commonly found with an explosion (Fractures, Burns, Amputations, Shrapnel, cuts and bruises and crisis response) but also smoke, debris, fire alarms, vehicle traffic and managing outside help while transporting these patients to the hospital. The many volunteer role players (victims) young and old were all given assignments, asked to play act to the best of the ability and to allow the rescue teams to practice medical and trauma assessments while treating patients in a large scale event. Lakewood First Aid, Lakewood EMS, Hatzolah, Brick EMS, Toms River EMS, Howell EMS, all played different roles throughout the drill which lasted for about two hours. NJ EMS Task Force were present with several of their Mass Casualty Incident trucks and trailers as support to the rescue crews on scene. Evaluators from several agencies can be seen walking around monitoring all activity to place in their final reports. The event was sponsored by Kosher Taco, DealMed & Elite Emergency Lights.